As my last post explained, the media economy in Canada has grown immensely and become far more complex in the past twenty-five years with the rise of the Internet and digital media. In this post, I ask whether the media have become more or less concentrated amidst all these changes? While opinions are rife on the issue, as McMaster University professor Philip Savage (2008) observes, the debate over media concentration in Canada “largely occurs in a vacuum, lacking evidence to ground arguments or potential policy creation either way” (p. 295). The need for good evidence on the question has been obvious over the past year in the context of Bell Canada’s bid to buy Astral Media, the ninth largest media company in Canada. Indeed, the CRTC’s decision to kill the deal in late October turned in a big way, although not entirely by any stretch of the imagination, on the evidence about media concentration. The same question will be front-and-centre in Bell Astral Round Two. While nobody knows what version 2.0 of the deal looks like outside of the two companies’ inner sanctum, and the CRTC staff currently vetting it before it is opened for public interventions (probably in the new year), the issue of concentration will undoubtedly loom large in whatever discussions, and regulatory actions, do occur. That said, however, we must make no mistake about it, studying media and internet concentration is not about Bell or Astral, or any specific transaction. In fact, the issue in the Bell Astral case is not if Bell is too big but whether telecom, media and internet markets in Canada are already too concentrated as a whole? How do we know one way or another? This post helps to address these questions. Grappling with these issues is not just about remedying the ‘missing evidence’ problem, but thinking clearly about how the issues are framed. Many critics point to media concentration as steadily going from bad to worse, but with little to no evidence to back up such claims. Perhaps the best known example of this is Ben Bagdikian, who claims that the number of media firms in the U.S. that account for the majority of revenues plunged from 50 in 1984 to just five by the mid-2000s. Similar views also exist in Canada, where critics decry what they see as the inexorable trend towards greater media concentration and its debilitating effects on “democracy’s oxygen”, for instance, or vilify the media moguls behind such trends who have, in these critic’s words, created “Canada’s most dangerous media company”. A second group of scholars set out to debunk the critics by quantitatively analyzing reams of media content only to find the evidence about how changes in media ownership and market structure effect content to be mostly “mixed and inconclusive” (Soderlund, et. al al. 2005). The problem with this conclusion, however, is that it proceeds as if media concentration’s ‘impact on content’ is the only concern, or as if preserving the existing status quo might not be a significant problem in its own right (Gitlin, 1978). Undeterred, this line of scholarship trundles on so that, half a decade later, similar studies by many of the same authors, Cross-Media Ownership and Democratic Practice in Canada: Content-Sharing and the Impact of New Media, reach pretty much the same conclusions (Soderlund, Brin, Miljan & Hildebrandt, 2011). A third school of thought mocks concern with media concentration altogether. According to this school, how could anyone believe that the media are still concentrated when there are thousands of news sources, social networking sites galore, pro-am journalists, user-created content and a cacophony of blogs at our finger tips, 700 television channels licensed by the CRTC, ninety-four newspapers publishing daily and smartphones in every pocket? Ben Compaine (2005), a media economist at MIT, has a one-word retort for those who think that concentration still matters amidst this sea of plenty: internet! Those in this camp also argue that focusing on concentration when traditional media face the perilous onslaught of global digital media giants such as Google, Amazon, Netflix, Facebook, and so on is akin to rearranging the deck chairs on the Titanic – foolhardy and doomed to fail (Thierer & Eskelen, 2008; Dornan, 2012). Journalistic accounts often share this view, routinely invoking, in mantra-like fashion, the idea that media are more competitive than ever. Like their acdemic counterparts, such accounts offer little to no evidence to support such claims, other than pointing to the same roster of foreign digital media goliaths as if examples equals evidence. It does not. While some might find it hard to fathom, there’s a fourth school of thought, and one that I largely subscribe to, that accepts that fundamental changes have occurred, but rejects claims that this renders concern with media consolidation obsolete. For all those who guffaw at charges of media concentration, it is easy to point, for example, to the fact that only about a third of the 94 daily newspapers said to exist are actually still publishing original content on a daily basis. Of the 700 television channels listed on the CRTC’s books, just over 200 actually filed a financial return last year. And half of those tv channels belong to just four companies — Bell (33), Shaw (46), Rogers (11) and QMI (12). Their share of the market, as we will see, is much higher yet. Keeping our eye on these facts also highlights, for example, how dominant incumbent players use price (usage-based billing) and bandwidth caps, for example and among other tactics, to protect their legacy television businesses (i.e. CTV, Global, CityTV, TVA), while hobbling rivals (Netflix) and limiting people’s choice as a result. This school also suggests that core elements of the networked digital media – search engines (Google), Internet access (ISPs), music and book retailing (Apple and Amazon), social media (Facebook) and access devices (Apple, Google, Nokia, Samsung, RIM) – may actually be more prone to concentration because digitization magnifies economies of scale and network effects in some areas, while reducing barriers in others. If this is correct, then we may be witnessing the rise of a two-tiered digital media system, with many small niche players revolving around a few enormous “integrator firms” at the centre (Noam, 2009; Benkler, 2006; Wu, 2010). Whilst we must adjust our analysis to new realities, it is also true that long-standing concerns have not disappeared either. To take just one case in point, consider the fact that during the 2011 election campaign, every single newspaper in Canada, except the Toronto Star, that editorially endorsed a candidatefor Prime Minister touted Harper – roughly three times his standing in opinion polls at the time and the results of the prior election. When 95 percent of editorial endorsements for PM across the nation stump for one man – Harper — something is amiss. Ultimately, talk about media concentration is really a proxy for bigger conversations about consumer choice, freedom of expression as well as democracy. While such discussions must adapt to new realities, the advent of digital media does not mean that such conversations should fall silent. Politics, values and heated debates are endemic to the topic, and this is how things should be (Baker, 2007; Noam, 2009; Peters, 1999). Discussions of media concentration will never turn on the numbers alone, and nor should they, but it is essential to be as clear as possible about the methods used to assess the issue. To begin, there is no naïve vantage point from which data about these issues can be innocently gathered and presented as if evidence is just out there laying in a state of nature, somewhere, waiting to be plucked like apples from a tree. Data, in other words, does not serve as a one-to-one map of the reality it claims to describe. Nonetheless, there are good ways to make a good body of evidence and bad. An essential factor all down the line is the need for researchers to be open and reflexive about their methods and theoretical starting points. A fuller discussion of the methodology that I use can be found here, here and here, but for now we can lay out the bare bones of the approach before turning to the analysis itself. I begin by selecting a dozen or so media sectors at the heart of the analysis: wired & wireless telecoms; cable, satellite & IPTV distributors; Internet access; broadcast tv; pay & subscription tv; radio; newspapers; magazines; search engines; social media sites; and online news services. Data were collected for each of these sectors over a twenty-seven year period, 1984 – 2011, first at four-year intervals up until 2008 and annually since. For the DIYers among you, here’s a handy dandy list of sources. Data for the revenues and market share for each ownership group in each of these sectors was then assembled. I then group each of the above sectors into three categories, assess the concentration level in each category, and then scaffold upward from there to examine the network media industries as a whole: (1) network infrastructure; (2) content: (3) online media. I typically drop wired and wireless telecoms from the whole of what I call the network media industries because the size of these sectors means that they tend to overshadow everything else. Lastly, I use two common tools — Concentration Ratios (CR) as well as the Herfindhahl – Hirschman Index (HHI) – to depict levels of competition and concentration over time. The CR method adds the shares of each firm in a market and makes judgments based on widely accepted standards, with four firms (CR4) having more than 50 percent market share and 8 firms (CR8) more than 75 percent considered to be indicators of highly levels of concentration. There has always been, even if episodically, keen interest in media ownership and concentration in Canada and the world since the late-19th and early-20th centuries. In the face of much corporate bluster, the BRC did this because the two dominant telegraph companies were giving away the AP news service to the top newspaper in cities across Canada for free in order to bolster their stranglehold on the lucrative telegraph business. Allowing this to continue, stated the BRC matter-of-factly, would “put out of business every news-gathering agency that dared to enter the field of competition with them” (1910, p. 275). Thus, in a conscious bid to use telecoms regulation to foster competition amongst newspapers, and to free up the flow of news on the wires, the BRC effectively dismantled the alliance. For upstarts such as Winnipeg-based Western Associated Press – which had initiated the case – it was a significant victory (Babe, 1990). Media concentration issues arose episodically thereafter and came to a head again in the 1970s and beginning of the 1980s, when three inquiries were held: (1) the Special Senate Committee on Mass Media, The Uncertain Mirror (2 vols. )(Canada, 1970); (2) the Royal Commission on Corporate Concentration (1978); and (3) the Royal Commission on Newspapers (Canada, 1981). Things lay dormant for more than two decades thereafter, but sprang to life again in the late-1990s and turn-of-the-21st century after a huge wave of consolidation thrust concerns about media concentration back into the spotlight. Three inquiries were held between 2003 and 2007 as a result: (1) the Standing Committee on Canadian Heritage, Our Cultural Sovereignty (2003); (2) the Standing Senate Committee on Transport and Communications, Final Report on the Canadian News Media(2006);[i] as well as (3) the Canadian Radio-Television and Telecommunications Commission’s Diversity of Voices inquiry in 2008. As I noted in my last post, for all sectors of the media economy in Canada, revenues grew immensely from $37.5 billion in 1984 to just under $70 billion last year (or from $12.1 billion to just under $34 billion when we exclude wiredline and wireless telecoms) (in inflation-adjusted “real dollars”). 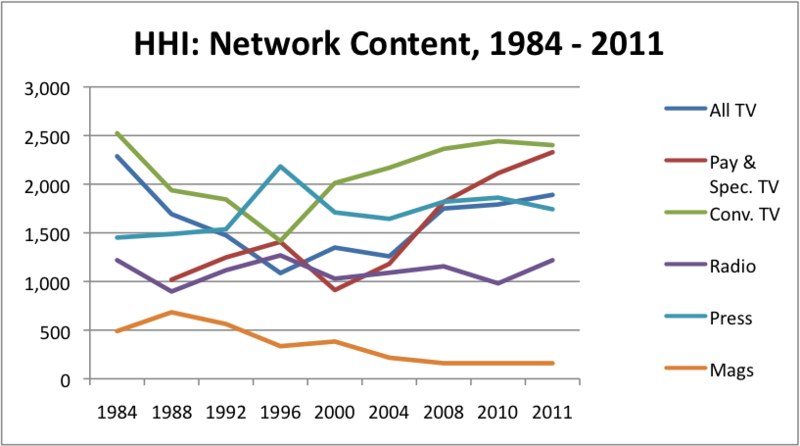 Between 1984 and 1996, new players meant more diversity in all sectors, except for newspapers as well as cable and satellite video distribution, where concentration climbed significantly. Conventional as well as pay and subscription television channels were already expanding during this time. In terms of ownership, incumbents and a few newcomers – e.g. Allarcom and Netstar – cultivated the field, with their share of the market growing steadily in tandem with the number of services available (underlying data for these claims can be found here). Concentration levels remained very high in wired line telecoms in the 1980s and early 1990s, while wireless was developed by two companies, Bell and Rogers. As had been the case in many countries, telecoms competition moved slowly from the ends of the network into services and then network infrastructure, with real competition emerging in the late-1990s before the trend was reversed and concentration levels again began to climb. In the 1980s and early-1990s, consolidation took place mostly among players in single sectors. Conrad Black’s take-over of the Southam newspaper chain in 1996 symbolized the times. In broadcast television, amalgamation amongst local ownership groups created the large national companies that came to single-handedly own the leading commercial television networks – CTV, Global, TVA, CHUM, TQS – by the end of the 1990s. While weighty in their own right, these amalgamations did not have a big impact across the media as a whole. There was still significant diversity within sectors and across the TMI sectors. The CBC remained prominent, but public television was being eclipsed by commercial television as the CBC’s share of all resources in the television ‘system’ slid from 46 percent in 1984 to half that amount by 2000 to just over twenty percent today (see the motion chart on CMCR website illustrating this point). Wave 1 – 1994 to 2000: Rogers acquisition of Maclean-Hunter (1994). Peaks from 1998 to 2001: (1) BCE acquires CTV and the Globe & Mail ($2.3b); (2) Quebecor takes over Videotron, TVA and the Sun newspaper chain ($ 7.4b) (1997-2000); (3) Canwest buys Global TV ($800m) and Hollinger newspapers papers, including National Post ($3.2b). Wave 2 – 2006-2007. Bell Globe Media re-branded CTVglobemedia, as BCE exits media business. CTVglobemedia acquires CHUM assets (Much Music, City TV channels and A-Channel). CRTC requires CTVglobemedia to sell City TV stations – acquired by Rogers (2007). Astral Media buys Standard Broadcasting. Quebecor acquires Osprey Media (mid-size newspaper chain)(2006). Canwest, with Goldman Sachs, buys Alliance Atlantis (2007) (Showcase, National Geographic, HGTV, BBC Canada, etc) – and biggest film distributor in Canada. Wave 3 – 2010 – ? Canwest bankrupt. Newspapers acquired by Post Media Group, TV assets by Shaw. BCE makes a comeback, re-buys CTV (2011) and bids for Astral Media in 2012, but fails to gain CRTC approval. That the massive influx of capital investment drove consolidation across the telecom, media and Internet industries during these periods is illustrated in Figure 1 below. Sources: Thomson Financial, 2009; FPInformart, 2010; Bloomberg Professional; CRTC, Communication Monitoring Report. Consolidation has yielded a fundamentally new type of media company at the centre of the network media ecology: i.e. the integrated media conglomerate. Extremely popular in the late-1990s in many countries around the world, many media conglomerates have since collapsed or been broken up (AOL Time Warner, AT&T, Vivendi, CBS-Viacom, and parts of NewsCorp, etc)(see, for example, Jin, 2011; Thierer & Eskelen, 2008; Waterman & Choi, 2010). The trend elsewhere has not, however, taken hold in Canada. Indeed, in Canada, sprawling media conglomerates are still all the rage. Four such giants and a half-dozen other large but more specialized companies part their size make-up the core ‘big 10’ companies in the network media economy: Bell (CTV), Shaw (Global), Rogers (CityTV), QMI (TVA), CBC, Post Media, Cogeco, Telus, Astral, and Eastlink. A detailed chart of each by ownership, revenues, and sectors operated in is available here and will be addressed further in the next post. 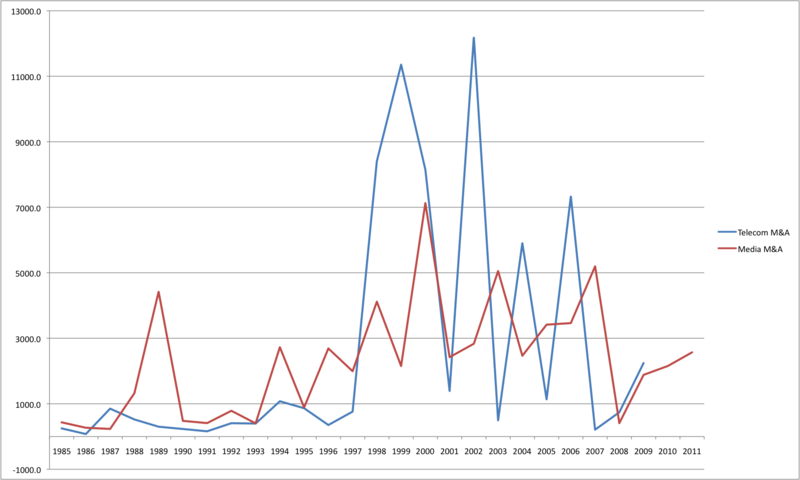 Looking at media concentration from the vantage point of the ‘big ten’, the media have become more concentrated than ever. Their share of all revenues (excluding telecoms services) rose sharply in the 1990s and between 2000 and 2008 hovered steadily in the mid- to low-60 percent range. The big four’s share of the network media economy subsequently rose significantly to just under 68 percent in 2010 (after Shaw’s acquisition of Global) and rose again to just under 70 percent in 2011 (when Bell re-acquired CTV) — an all-time high and a substantial rise from 52% in 1992. The levels of media concentration in Canada are more than twice as high as those in the U.S., based on Noam’s analysis in Media Ownership and Concentration in America (2009). At the end of the post, I combine these again to complete the analysis of the network media industries as whole in a slightly different form. All sectors of the network infrastructure industries are highly concentrated and pretty much always have been, although Internet Access is a partial exception. Much the same can be said with respect to wireless services: they have consistently been highly concentrated, and still are until this day, despite the advent of four newcomers in just the past two years: Mobilicity, Wind Mobile, Public and Quebecor.CR4 and HHI measures for wired telecoms scores fell during the late-1990s as greater competition in wired line telecom services took hold. They reached their lowest level ever between 2000 and 2004 before after shocks from the collapse of the speculative dot.com bubble took out many of the new rivals (CRTC, 2002, p. 21). Competition grew more and more feeble for most of the rest of the decade before drifting modestly upwards since 2008. Concentration levels, however, still remain high by late-1990s, turn-of-the-century standards, as well as those of the CR and HHI measures. Two competitors – Clearnet and Microcell – emerged in the late-1990s and managed to garner 12 percent of the market between them, but were then taken over by Telus and Rogers in 2000 and 2004, respectively. Whether the recent round of newcomers will fare any better it is still too early to tell, but with only 2.2 percent of the market as of 2011 they are a long way from the high tide of competition set a decade ago. As the telecoms and Internet boom gathered steam in the latter half of the 1990s new players emerged to become significant competitors in Internet access, with four companies taking more than a third of the ISP market by 1996: AOL (12.1%), Istar, (7.2%), Hook-Up (7.2%) and Internet Direct (6.2 percent). The early ‘competitive ISP era’, however, has yielded to more concentration since. Although the leading four ISPs accounted for a third of all revenues in 1996, by 2000 the big four’s (Bell, Shaw, Rogers & Quebecor) share had grown to 54 percent. Things stayed relatively steady at the level for most of the decade before inching upwards in the past few years to reach 57.1 percent in 2011. HHI scores for internet access also moved upward between 1996 and 2000, but are still low relative to most other sectors. However, this is probably more an indicator of the limits of the HHI method in this particular case, since 93% of high-speed Internet subscribers rely on one or another of the incumbent cable or telecom companies’ ISPs to access the Internet, according to figures in the CRTC’s Communication Monitoring Report (p. 148). ISP provision in Canada is effectively a duopoly, with the left over 6-7% of the market not dominated by the incumbents scattered among the 400 or so independent ISPs that still exist. This is a slight increase from last year, but it does not mark the return to competitive internet access. Canada has relied on a framework of limited competition between incumbent telecom and cable companies for wiredline, wireless, internet access and video distribution markets and in all of these markets they dominate, with some other smaller rivals in each. Cable, satellite and IPTV distribution is one of the only segments assessed where concentration has risen steadily from low levels in the 1980s (850) to the top of the scales in 1996 (2300), before drifting downwards by the turn-of-the-century to the low 2000s where it has remained ever since. It has dipped below that, to the 1900-range, for the last five years, but this is still at the very high end of the scale. As I noted in the last post, the IPTV services of the incumbent telcos – Bell, MTS, Telus and SaskTel – are becoming a more significant factor in the distribution of television, after a slow and staggered start. By 2011, IPTV services accounted for 7.6 percent of the TV distribution market, based on my numbers, or 3.8 percent using CRTC data (see page 96). While I have yet to get to the bottom of why this discrepancy exists, what can be said is that, on the basis of my figures, the growth of IPTV services has made small incursions into the incumbent cable and satellite service providers’ turf (i.e. Shaw, Rogers, Quebecor, Cogeco and Eastlink). However, this has done little more than nudge the CR and HHI scores, as the table above shows. Over the last twenty-seven years, cable tv has become ubiquitous and new tv distribution infrastructures have been added to the fold – DTH in the 1990s, and now, slowly, IPTV. New players have emerged, but never have so few owned so much. New technologies have generally added to this and have not fundamentally disrupted the broad trajectory of development when it comes to tv distribution channels: more channels, and even some new players, but with more of the whole in the hands of the old. The wired society in Canada is probably the poorer for this. Until the mid-1990s, all aspects of the tv industry (i.e. conventional broadcast tv as well as pay and specialty channels) were moderately concentrated by HHI standards and significantly so by CR measures. Competition and diversity made some modest inroads from 1998 to 2004, but the trend abruptly reversed course and levels have climbed steadily and substantially since, and sharply in the last two years. Figure 2, below, shows the trend in terms of CR scores; Figure 3, in terms of the HHI. Shaw’s take-over of Canwest’s television assets in 2010 and Bell’s buy-back of CTV last year. 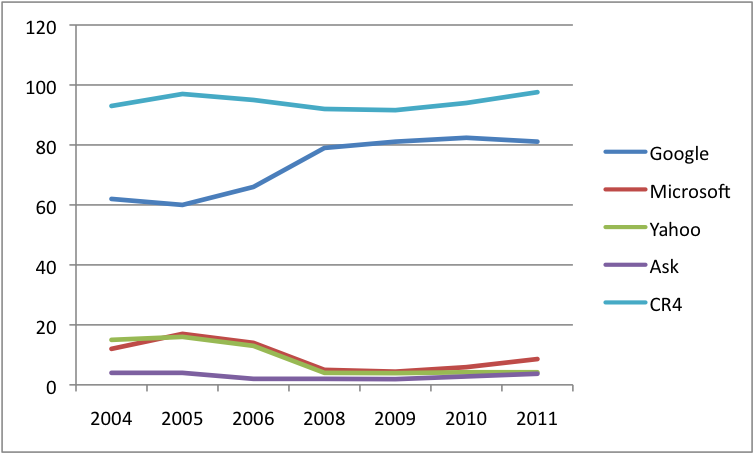 The big four’s share of all tv revenue before these transactions in 2008 was 70%. A ten percent leap in concentration in two years is a lot. If the CRTC had approved Bell’s acquisition of Astral Media – the fifth largest television company in Canada, ahead of Quebecor – the all-time high levels of concentration set in 2011 would have been surpassed by an even higher 89.5%. In contrast, the big four accounted for 61% of the tv biz in 2004, a time before major players such as Alliance Atlantis and CHUM were bought out by the now defunct Canwest and Bell/CTV 1 (circa 2000-2006), respectively. 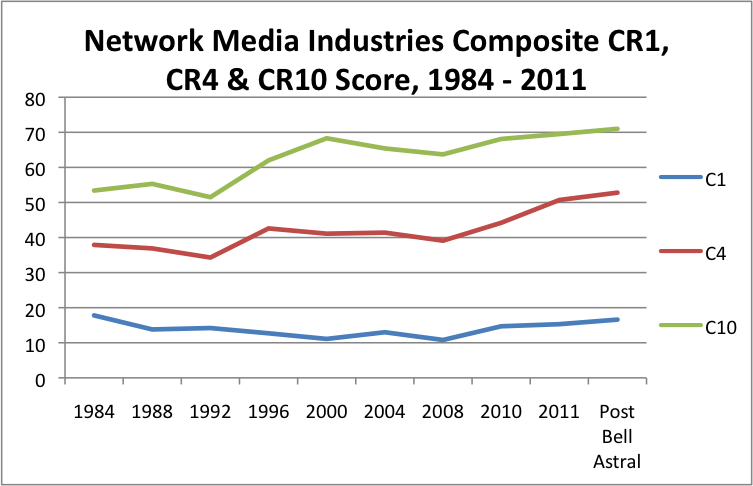 The CR and HHI measures for tv were at all time lows in the 1990s. This was a time when newcomers emerged (Netstar, Allarcom), yet before the time when the multiple ownership groups that had stood behind CTV and Global for decades combined into single groups. The period was also significantly more diverse because the CBC no longer stood as a central pillar in tv and radio, while pay and specialty television channels were finally making their mark. Today, the latter are the crown-jewel in the tv crown. Today the largest four tv providers after Bell and Shaw are: the CBC, Rogers, Astral, and QMI, respectively, and in that order. By 2011, these six entities accounted for ninety-five percent of the entire television industry. Similar patterns are replicated in each of the sub-components of the ‘total television’ measure (conventional television, pay and specialty channels), as the chart above illustrates. In contrast, in 2004, the six largest players accounted for a little over three-quarters of all revenues. The run of HHI scores reinforces the view that the television industry is highly concentrated and has become markedly more so in just the past two years. Like the cable industries, there has never been a moment when diversity and competition has flourished in the newspaper sector. Consolidation rose steadily from 1984, when the top four groups accounted for two-thirds of all revenues, to 1996, when they accounted for nearly three-quarters – a level that has stayed fairly steady since, despite periodic shuffling amongst the main players at the top. Levels declined slightly in 2011 from 2010, from 77% to 75%, likely on account of Postmedia’s decision to sell some of its newspapers (Victoria Times Colonist) and to cut publishing schedules at others. Of all media sectors, magazines are least concentrated, with concentration levels falling by one-half on the basis of CR scores and two-thirds for the HHI over time. I have not been able to update the data for this sector for 2011, but there is little to suggest a need to change this view. Radio is also amongst the most diverse media sectors according to HHI scores, but slightly concentrated by the C4 measure. In fact, in 2011, it became moreso, likely because of a shuffling of several radio stations between Shaw/Corus and Cogeco. Bell’s take-over bid for Astral – the largest radio broadcaster in Canada with 17.5% market share – would also have further pushed radio in the direction of concentration had it been approved last month by the CRTC. Had that scenario come to pass, levels of concentration would have still remained well-beneath the CRTC’s self-defined thresholds, but high by the CR measure and just moderately high by the HHI. So far, there’s little reason to believe that trends are any different in the online realm, as measures of the ISP segment showed. But what about other core elements of the increasingly Internet-centric media universe, such as search engines, social media, online news sources, browsers, and smartphone operating systems? The trends are clear. Concentration in the search engine market continued to grow between 2010 and 2011, with the CR4 score rising from 94% to 97.6%. Google’s share of the market, however, seems to have plateaued, at just over 81 percent of this domain. Microsoft (8.6%), Yahoo! (4.2%), and Ask.com (3.7%) trail far behind, yielding a CR4 of 97.6% and an off-the-charts HHI of 6,683. Social media sites display a similar but not quite as pronounced trend, with Facebook accounting for 63.2% of time spent on such sites in 2010, trailed by Google’s YouTube (20.4%), Microsoft (1.2%), Twitter (0.7%), and News Corp.’s MySpace (.6%) (Experien Hitwise Canada, 2010). Again, the CR4 score of 86% and HHI score of 4426 reveal that social networking sites are highly concentrated. Similar patterns also hold for other layers of the media ecology. The top four web browsers in Canada – Microsoft’s Explorer (52.8%), Google’s Chrome (17.7%), Firefox (17.1%) and Apple’s Safari (3%) – have a market share of over 90 percent (Comscore, 2011). There is no data available for Canada with respect to smartphone operating systems, but US data shows that the top four players in 2010 accounted for 93 percent of all revenues: Google’s Android OS (29%), Apple’s iOS (27%), RIM (27%) and Microsoft’s Windows 7 (10%) (Nielsen, 2011). However, not all areas of the internet and digital media environment, of course, display such patterns. The picture with respect to online news services, for instance, is significantly different. Between 2003 and 2008, the amount of time spent on online news sites nearly doubled from 20 to 38 percent, with most of the leading 15 online news sites simply being the extensions of well-established media companies: cbc.ca, Quebecor, CTV, Globe & Mail, Radio Canada, Toronto Star, Post Media, Power Corp. The other major sources included CNN, BBC, Reuters, MSN, Google and Yahoo! (Comscore, 2009; Zamaria & Fletcher, 2008, p. 176). While that trend meant that attention was consolidating around a few online news sites, and those of traditional journalistic outlets in particular, it nonetheless seems clear that Canadians have diversified their news sources relative to the traditional news environment (newspapers, tv, radio, magazines). On either the CR or HHI measure, online news fall under the concentration thresholds and are diverse relative to any of the other sectors, except magazines. However, the fact that concentration levels edged upwards between 2004 and 2007, after the rapid “pooling of attention” that took place between 2003 and 2007 (see immediately above), suggests that a certain plateau might have been reached in terms of the range of sources people are using. Nonetheless, online news sources are not concentrated on the basis of the measures used here. The following table shows the results. Combining all the elements together yields a birds-eye view of long-term trends for the network media as a whole. 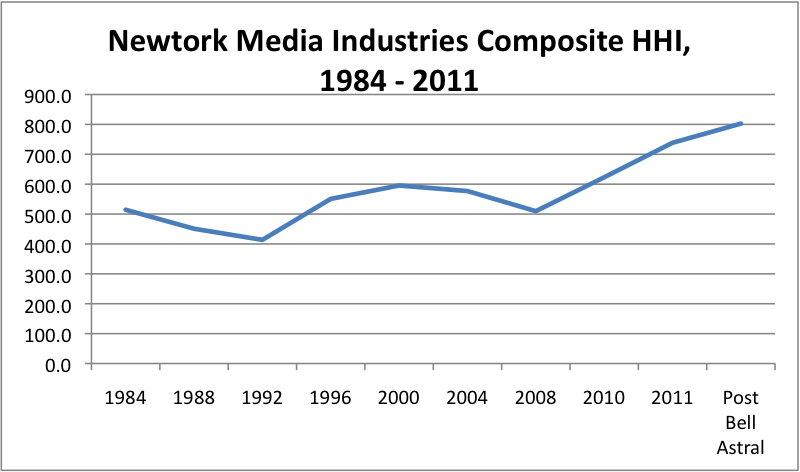 As Figure 4 below shows, the HHI score across all of the network media industries is not high by the criteria set out earlier, but the long-term upward trend is clear and significant. 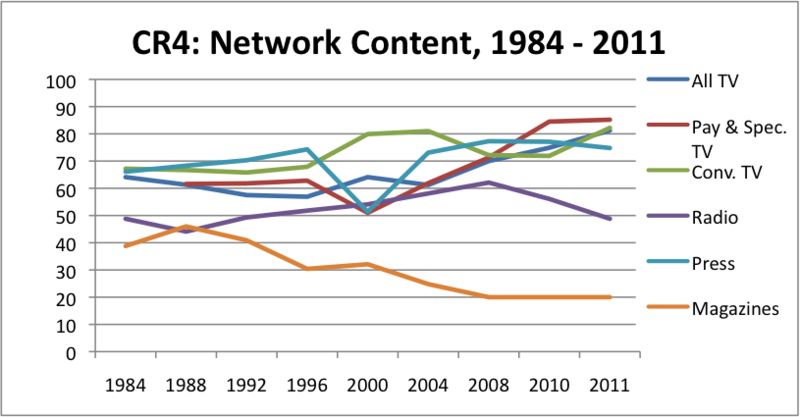 While the HHI for the network media fell in the 1980s and early-1990s, by 1996 trends had reversed and levels were higher than they were a dozen years earlier. Thereafter, the number rose steadily to close to 600 in 2000, where it hovered for several years before falling again in 2008. Since then, however, the HHI score has shot upwards, rising from 510 in 2008 to 623 after Shaw acquired Global and then to 739 once Bell re-acquired CTV after having sold down its majority stake a few years earlier. The effect of the Bell Astral deal would have been significant in terms of the network media as a whole, raising the HHI score to over 800 – an all time high. This is still low by HHI standards, but we must bear in mind that we are talking about concentration across the entire sweep of the network media industries, not just a random assortment of a few sectors. The CR4 standard, as shown in Figure 5 below, reveals the trend even more starkly, with the big four media conglomerates – Bell, Shaw, Rogers & QMI – accounting for more than half of all revenues in 2011, a significant rise in a vastly larger media universe from just under forty percent held by the big four twenty-seven years earlier in what was a Lilliputian pond by comparison. While still only moderately concentrated by the CR4 standard, this is for all media combined. In each and every single sector of the media that the big four operate, they dominate, as the earlier review of CR and HHI scores illustrated. Moreover, the trend in both scores is up, significantly so in the past three years from a CR4 of around 40% to its current level of just over 50%. If this really was a golden digital media age, as some like to contend, that number should be going firmly in the opposite direction. Several things stand out from this exercise. First, we are far from a time when studies of media and internet concentration are no longer needed. Indeed, theoretically-informed and empirically-driven research is badly needed because there is a dearth of quality data available and because, one after another, the press of events and specific transactions – Bell Astral in 2012, but Bell’s re-acquisition of CTV the year before and Shaw’s acquisition of Global in 2010 – demands that we have a good body of long-term, comprehensive and systematic evidence ready-to-hand. This kind of data is still very hard to come by and data collection for 2011 reconfirmed that at every step of the way. The CRTC still needs a dramatic overhaul of how it releases information and of its website, as David Ellis has recently argued so eloquently. The underlying data sets it includes in seminal publications like the Communications Monitoring Report, Aggregate Annual Returns, and Financial Summaries needs to be made available in a downloadable, open format that allows people and researchers to use it as they see best. The regulated companies themselves must also be made to be more forthcoming with data relevant to the issues, and not less, as they so strongly desire. The trajectory of events in Canada is somewhat similar to patterns in the United States. Concentration levels declined in the 1980s, rose sharply in the late-1990s until peaking around 2000. However, it would appear that whereas in the U.S. a process of deconsolidation set in thereafter, with the obvious exception of Comcast’s blockbuster acquisition of NBC-Universal last year, concentration levels in Canada have climbed, and steeply so, in the past three or so years. Current media concentration levels in Canada are roughly two-and-a-half times those in the U.S. and high by global standards (Noam, 2009). Moreover, large media conglomerates straddle the terrain in Canada in a manner that is far greater than in any of the other thirty countries studied by the IMCR project, including the U.S., Germany, Japan, Australia, the UK, and so on, where media conglomerates are no longer all the rage as they once were a decade ago. The assets from the bankrupt Canwest have been shuffled in recent years, and some significant new entities have emerged (e.g. Channel Zero, Post Media, Remstar, Teksavvy, Netflix, The Mark, Tyee, Rabble.ca, Huffington Post). The overall consequnence is that we have a set of bigger and structurally more complicated and diverse media industries, but these industries have generally become far more concentrated, not less. There is a great deal more that can and will be said about what all this means, but in my eyes it means that concentration in no less relevant in the “digital media age” of the 21st century than it was during the industrial media era of centuries’ past. Thanks for this series – the wide view is something I need at the moment, and the data should come in handy. Good stuff Dwayne (as usual).